Why do i still have white bumps 6 months post op? Im 6 months post op FUE, and i still have white bumps everywhere where my hair was transplanted pretty much, especially both temples and the whole front of the hairline. There are even these white bumps where hair hasnt even grown out of yet, which is a lot of growth i still havent gotton. Please tell me that these will completely go away soon because im going to jump off a building pretty soon. I have a feeling that they are not going to go away if they havent after 6 months. » even grown out of yet, which is a lot of growth i still havent gotton. » to go away if they havent after 6 months. Can I see some pictures? Do they hurt? » » even grown out of yet, which is a lot of growth i still havent gotton. » » to go away if they havent after 6 months. » Can I see some pictures? Do they hurt? Its going to take me a while i have to download software to resize pictures. No they dont hurt but i would just like some answers to my questions regardless. Well, its really hard to say without pictures. White bumps? How big? Shaped how? Around the follical? People need to know more before commenting. It wouldn’t be fair to you otherwise. » » » to go away if they havent after 6 months. » » Can I see some pictures? Do they hurt? white like pus? It sounds like infection, what did your doctor say? » » » » to go away if they havent after 6 months. » » » » Thanks. » » » Can I see some pictures? Do they hurt? » white like pus? It sounds like infection, what did your doctor say? No, i dont know hoe else to explain it. They are white little raised white scars where the follicle was implanted. Will they go away??? I cant figure out how to resize my pictures ive tried just about every program i have ant not one signle resize option. I have to download software and do it. » Well, its really hard to say without pictures. White bumps? How big? » commenting. It wouldn’t be fair to you otherwise. Here is a pic. My camera is crappy and you can see it a lot more in person. Look at the bumps on the temple. Thanks. » » » » » to go away if they havent after 6 months. » » » » » Thanks. » » » » Can I see some pictures? Do they hurt? » » » questions regardless. » » white like pus? It sounds like infection, what did your doctor say? » scars where the follicle was implanted. Will they go away??? » software and do it. 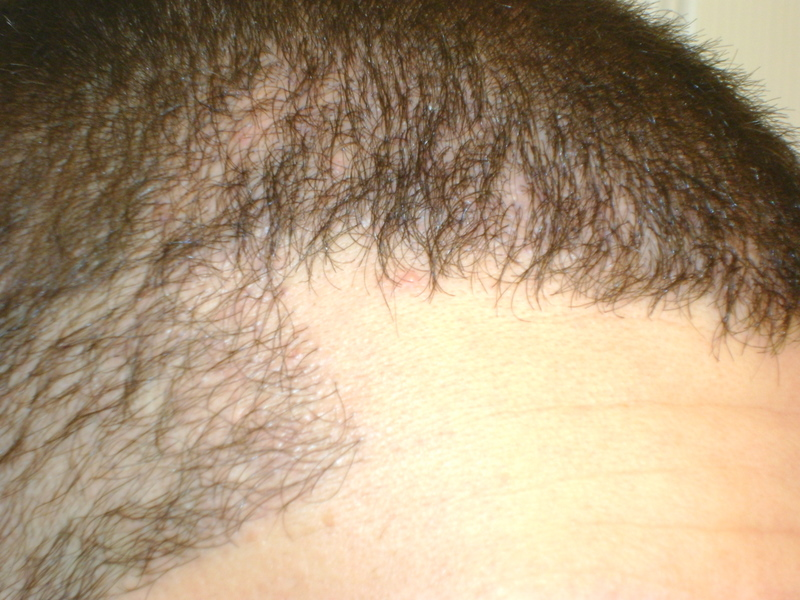 Nobody can help you if they don’t get to see what they look like, I had strip done, I never saw anything like that on my scalp, maybe this is something that happens to fue patients only? I think you did fue right? » » » » gotton. » » » » » » to go away if they havent after 6 months. » » » » » » Thanks. » » » » » Can I see some pictures? Do they hurt? » » » » questions regardless. » » » white like pus? It sounds like infection, what did your doctor say? » » scars where the follicle was implanted. Will they go away??? » » software and do it. » something that happens to fue patients only? I think you did fue right? I posted the pic, yes fue. » » Well, its really hard to say without pictures. White bumps? How big? » person. Look at the bumps on the temple. Thanks. i think i read somewhere also that those were ingrown hairs, i’m not sure though of where on this site. i know i’ve seen that before though. who was your doc and how many grafts or hairs did you have transplanted to that spot? are the white dots just in the temple area? really doesnt look that noticeable to me from the photos but if u say it looks worse in person then not sure. » though of where on this site. i know i’ve seen that before though. » that spot? are the white dots just in the temple area? » looks worse in person then not sure. I dont get it, ingrown hair? I dont get what that means? These white bumps are around where the hair follicle comes out. Are they going to go away? Yes it is TOTALLY noticable in person, and its absolutely unacceptable to me there is no way im going to have this showing on my head, this wasnt part of the deal. I had 3500 grafts to lower the hairline a but, the temples a bit, and zones 1 and 2. Im not going to mention the Dr. yet im goint to give it untill 8 months but it was a very reputable top doc who did the incisions and the technicians implanted and extracted the grafts. » » person. Look at the bumps on the temple. Thanks. This is clearly the temple, can you not see? They look like what this guy has in this picture link below. White bumps around where each hair follicle comes out of. Mine isnt quite as bad as this guys but you can easily see it in person and its totally unacceptable to me its a deformaty. Ive read this is called cobblestoning. WILL THEY GO AWAY??? This guys hasnt! What the heck causes this and how would whoever did the transplant make a mistake like this for this to happen? » » though of where on this site. i know i’ve seen that before though. » » that spot? are the white dots just in the temple area? » » looks worse in person then not sure. » are around where the hair follicle comes out. Are they going to go away? » part of the deal. » and the technicians implanted and extracted the grafts. 3500 grafts into the hairline and lowered the temples? We know who doc is. Only one doc will do such a thing. And he has had other patients on this board with those bumps too. » » » though of where on this site. i know i’ve seen that before though. » » » that spot? are the white dots just in the temple area? » » » looks worse in person then not sure. » » part of the deal. » » and the technicians implanted and extracted the grafts. » this board with those bumps too. Did they go away or what? I was told everything would even out but it doesnt look like it to me. » doesnt look like it to me. The person was farther along than you and never reported them going away. He also had a poor yield. Sorry. I sincerely hope yours does not follow this pattern. Once (if) you reveal your doc the shills (marketing campaign) for him will be all over this thread telling you different. Thanks for providing the info and hopefully things turn around. Please keep us informed. » be all over this thread telling you different. everybody knows Rawman went to Armani, I remember he posted this himself many times before. Is this the same Rawman or a different poster? » » doesnt look like it to me. » The person was farther along than you and never reported them going away. I was told byu two reps and the instruction manual that i could take a light shower over the recepient area and allow the scabs to fall off, so this is what i did. at 1 month i had like 100% of my scabs still and i took a light shower and the water hitting the scabs made them fall out along with hairs attatched to them. Is this what caused this problem or what??!! I was just following instrunctions!